On-the-go, sleep deprived, tech geek, pop culture junkie, foodie, and LDS pilot wife and mother, trying to embrace the fact that she lives in Utah again. I am a woman who thrives on family, faith, fun, friends, and good food. I embrace change. Life is most meaningful when it is filled with people and purpose. I am a Yellow, an ENFP, an Aquarius. I was born and raised in the Portland, Oregon area. I am the daughter of an audio-visual engineer, and from a long line of artists and musicians. I have more vivid memories as a child of playing with TI Computers and broken VCR carcasses, than I do of playing with Barbies and girly toys. My childhood dream was to be a Radio DJ, and part of me hopes that will someday happen. I love to sing, and have participated in childrens’, jr. high, high school, college, community, and semi-professional choirs. In the past, I was a pretty good instrumentalist (violin, cello, guitar, handbells, percussion), but nowadays I’m lucky if I have enough time to successfully plunk something out on the bass guitar or piano. I also have a mad obsession with musical theater. I am a lifelong member of the Church of Jesus Christ of Latter-Day Saints. My greatest joys in life come from being a wife and mother. Taylor and I have been married 5 years, thanks to a successful internet dating hookup. I was a divorced single mom, he was ready to drop out of BYU…a match made in heaven. Just weeks after our wedding, an opportunity arose from him to pursue his lifelong dream of becoming a pilot, and we “flew” with it. Three years, and an incomprehensible amount of student loan debt later, he’s “living the dream” as a 3rd year First Officer at a Memphis-based regional airline. His training and work assignments have moved us through California, Michigan, and Georgia…and for now we’re settled in Spanish Fork, UT. Our daughter Rosie is 9, and is the brightest source of joy in my life. She’s my clone, my doppelganger, my buddy, my child. Rosie’s a bundle of joy, happiness, and love that puts a smile on everyone’s face. She keeps me together when daddy’s off flying. I have a degree in Humanities, and I love culture, theater, music, architecture, and all forms of artistic expression. I love to travel and hope to see much of the world in my life. I am known to drop everything on a Friday afternoon, hop a non-rev flight, and spend the weekend with a friend across the country. To date, I’ve been to 37 U.S. states, 3 Canadian Provinces, and the UK. Next up on our travel wishlist are Japan, Australia, and Mexico. I have been blogging since 2002, although I only show my archives through 2004 on this site (Really, the details of my first marriage are not worth your time). In addition to my personal blog, I contribute blog posts to Pilot Wives Club, Modern Molly Mormon, and several other sites. I’m on Facebook, Twitter, and lots of other sites. 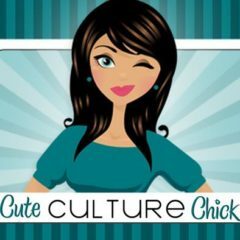 If you see a CuteCultureChick anywhere else on the web, it’s probably me.